10,000 seats, 3,000 berm (grass) seats. 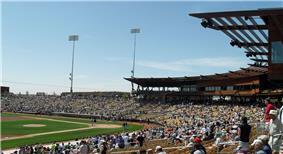 Camelback Ranch - Glendale is a stadium in Phoenix, Arizona owned and operated by Glendale, Arizona. It is the spring training homes of the Los Angeles Dodgers and Chicago White Sox. The stadium holds 13,000 people. 10,000-plus seats, 3,000 bermed grass seating. There are 8 full suites, 4 mini-suites, 1 press box, 1 suite-level party deck, and a series of outfield terraces that create party areas. Over 5000 plants and trees. Gabion (rock) retaining walls, earth-tone (caramel) stadium seat color, and other appointments - that blend with the natural desert colors of Arizona. Additionally, construction utilizes sweeps and angles instead of a big-box look. 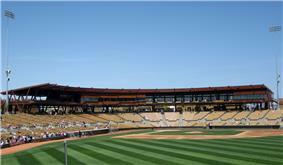 ^ "Glendale's ballpark gets a name: Camelback Ranch". Arizona Republic. 2008-11-21. ^ Bill Plaschke (2009-03-08). 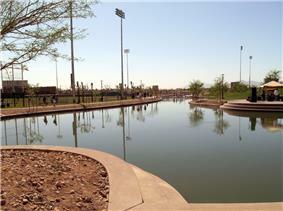 "Dodgers' new spring home in Phoenix is a site to behold". Los Angeles Times.